We all know that blueberries and cream cheese go well together, so I decided to take this combo to another level. 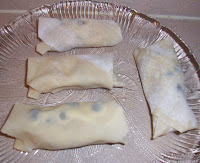 Blueberries + cream cheese + mascarpone cheese, all wrapped up in a wonton wrap, fried until hot and melty and delicious, and then served with a blueberry lemon sauce. These are easy to make, fun to eat, and make a fantastic dessert! 1. Mix cornstarch in 2/3 cup water until dissolved. Pour into small pot, and add brown sugar, lemon juice and vanilla. Heat over medium high heat, stirring until mixture thickens. Add blueberries and 1/3 cup more water, and let cook until boiling, stirring occasionally. Reduce heat to low, and let cook for 10 more minutes. Remove from heat. 2. In a bowl, combine whipped cream cheese, mascarpone cheese and confectioners sugar and mix. Fold blueberries into mixture gently. 4. In a large pot, pour oil to about 2-3 inches. Heat over medium-high heat. Using a large spoon, gently place wontons into oil, a few at a time. Fry until golden, turning occasionally, about 2-3 minutes. Drain on paper towels. 5. Serve wontons with blueberry lemon sauce. Let cool slightly before enjoying. Makes 8 wontons. For more info on blueberries and delicious recipes, visit the Blueberry Council. Also check out their Facebook page to connect with other blueberry fans!